Home › Alumni › Alumni Testimonials › Alumni Spotlight #6: Rob Blinn, Ph.D. Rob Blinn graduated from PGSP’s Ph.D. program in 1996. During his internship at the National Asian American Psychology Training Center in San Francisco he worked at the Hunan Medical University in Changsha, Hunan, China. Since graduating, Dr. Blinn has worked on men’s issues, crisis intervention, suicide and violence prevention, counseling with suicide survivors, anger management, selective mutism, treatment of depression, and psychological and psycho educational testing. He has been Clinical Director of a mental health center serving 12 Nebraska counties, and is currently Director of the Family Counseling Center of the Beijing United Family Hospital and Clinics. 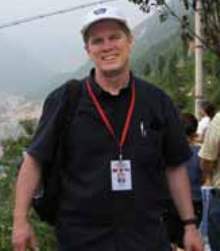 His most recent work has been coordinating the China Earthquake Relief Project (CHERP). At his request, volunteer teams of expert somatic practitioners from the United States were sent to the worst-hit areas of Sichuan to help treat the psychological and emotional damage of earthquake survivors. Beichuan, where Dr. Blinn is pictured at right, was at the epicenter of the 2008 Sichuan earthquake.